Active and passive management, where is it going to end ? This post was originaly published in French on the website quantalys.com as an answer to Philippe Maupas’s posts on the subject. Hello Philippe and thanks for you post. Two points drew my attention while reading your posts. First of all, it is clear in the various studies presented that costs still constitutes the best leading indicator of future performance, may they be active or passive. No surprise here, this is both intuitive and widely proved. It is still a good thing to remind to investors though. Then, you raise the possibility that the growth of passive management, very strong for now, might get slowed down by the the upcoming arbitrage opportunities that should logically appear above a certain threshold of assets managed with a passive strategy, strategy which is uncorrelated with underlying economic reality and therefore prone to arbitrage. But telling at which level this might happen is far from easy. There will be, I agree, a equilibrium level between active and passive asset management, but which one ? Because the difficulty is that it will probably depend on at least two tightly linked parameters : first the fee differential between active and passive funds, and second the respective share of assets they manage. Management fees are a very good leading indicator of the funds overperfomance ( those three studies are quite clear on this). The lower the fees, the higher the return. An active fund’s recent overperformance is also a very good leading indicator of the growth of its assets under management. The better the overperformance, the larger the assets pouring in. There is therefore a potentially strong negative correlation between fees of active funds and the evolution of their assets under management in the following years. And this gives us a link between the two parameters we identified . But we are not any closer from what we search ! First choice: they decide not to lower their fees and maintain them at their current level which is on average from 1% to 2% above the fees of their passive counterparts. Most of passive funds would therefore continue to grow up to the point where arbitrages opportunities would be so strong that the overperformance of surviving active funds would rise up to the fee differential. This would lead to an equilibrium where active funds would still exists but would be very few. Second choice: they decide that they cannot lose that much market shares and decide to lower their fee the harsh way up to par with passive funds. In this case market shares would stop moving fast as any flow from active to passive would then create an immediate arbitrage opportunity. 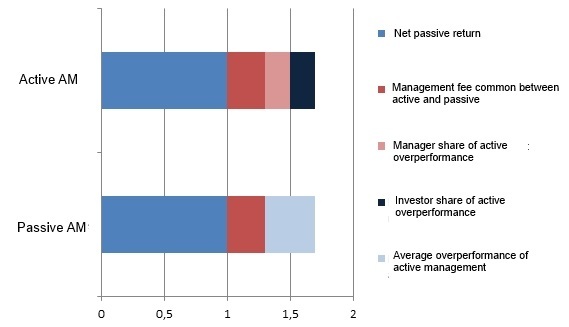 Active management would overperform passive on average, but at the cost of a discretionary risk. In those two scenarios we reach the equilibrium of assets and fees. In a more practical way this is of course some kind of mix of those two unrealistic scenarios that will happen. Active managers who accept to lower their fees (and costs of course) will keep a large share of their current assets under management. Those who refuse will see their assets melt, leaking quickly into passive funds. And those combined effect will lead to stabilize the market in between the two extreme situation we described. And this is exactly what is happening right now. Passively managed asset raise, active funds fees decline. But where is it going to end ? Which level of fees, and market shares ? To what extent the relative shares of assets managed passively and actively creates value for the active management to overperform passive ? We realize that the equilibrium would be economically stable, as active investors would get a slightly average higher return a the cost of discretionary risk (the fact that they could also get a lower return than passive), and active asset managers would get slightly higher fees, which is normal as there is more work. Conclusion : it is absolutely necessary to determine the potential added value of active asset management linked to a defined level of passive management market share. Next Next post: The French client of roboadvisors aka the “five-legged sheep”.